Nearly missed it – I really need a news address. Oh wait, I do have one! The next meeting of the Wakefield RISC OS Computer Club takes place tonight – Wednesday, 2nd November – and this month Steve Fryatt will be talking about Ovation, the DTP package originally written by David Pilling. Not to be confused with its younger ‘Pro’ sibbling – which is used to create the club’s monthly newsletter – Ovation is now available for free, with the source code available, and further work has been done on it by Rick Murray. The meeting starts at 7:45pm, and takes place at the West Yorkshire Sports and Social Club, Sandall Hall Close (off Walton Lane), (A61) Barnsley Road, Sandal, Wakefield, WF2 6ER. For non-members there is a £3.00 entry fee – but it’s worth investigating the benefits of membership. 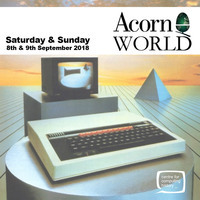 The Centre for Computing History, a computing museum based in Cambridge, will be playing host to an event this coming weekend that should be of interest to any and all fans of Acorn Computers: Acorn World 2018. Organised by the Acorn and BBC User Group (ABUG) in association with the museum, the event will run from 10:00am until 5:00pm on both Saturday the 8th and Sunday the 9th of September, and will offer an eye-popping range of hardware and software from both the Acorn and post-Acorn eras, with many of the computers on display running software for visitors to try out. A modern event with a retro bent! I n just over a week’s time, the Centre for Computing History, based in Cambridge, will be hosting an event that should be of interest to anyone with fondness for computers that came from the Acorn stable – Acorn World 2017. EtherStat: a utility to display the status of your ethernet connection. OvHTML: an HTML import filter for OvationPro. Scan32bit: A file scanner that searches for possible 32-bit problems. The bunker has been engulfed in chaos for quite a while – with a heavy workload leading to a period of hectic and frantic headless chicken impersonations. On top of that, a partial change of platforms has been undertaken, with some work being migrated from Windows (grr, spit, hiss) to Linux – and being completely new to Linux, that has meant adding a bit of self-education into the mix, not to mention that the installation didn’t go entirely smoothly!